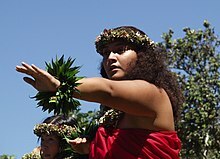 They include Taiwanese aborigines, the majority of ethnic groups in Brunei, East Timor, Indonesia, Madagascar, Malaysia, Micronesia, the Philippines and Polynesia, as well as the Malays of Singapore; the Polynesians of New Zealand, Hawaii and Chile; the Torres Strait Islanders of Australia; the non-Papuan peoples of Melanesia and coastal New Guinea; the Shibushi-speakers of Comoros and the Malagasy and Shibushi-speakers of Réunion. They are also found in the regions of Southern Thailand, the Cham areas in Vietnam and Cambodia, parts of Myanmar, the Hainan island province of China, parts of Sri Lanka and some of the Andaman Islands. 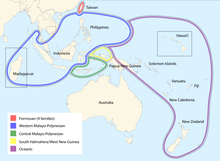 Additionally, modern-era migration brought Austronesian-speaking people to the United States, Canada, Australia, the United Kingdom, mainland Europe, Cocos (Keeling) Islands, South Africa, Sri Lanka, Suriname, Hainan, Hong Kong, Macau and West Asian countries. 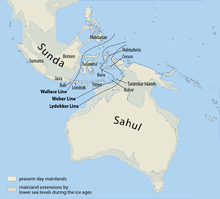 Ethnic Maldivians also possess a genetic connection to the Austronesian-speaking groups of maritime Southeast Asia via gene flow from the Malay Archipelago. Lumad: Mindanao. e.g. Kamayo, Manobo, Tasaday, T'boli. Malagasy: Madagascar. e.g. Betsileo, Merina, Sakalava, Tsimihety. Left: Petroglyph on the western coast of Hawaii. Petroglyphs were symbolic, but could not encode language. Right: An Austronesian abugida known as Baybayin from the Philippines. With the possible exception of rongorongo on Easter Island, writing among pre-modern Austronesians was limited to the Indianized states and the sultanates of Maritime Southeast Asia. 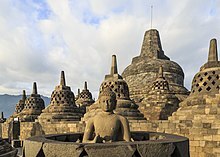 These systems included abugidas from the Brahmic family, such as Baybayin, the Javanese script, and Old Kawi, and abjads derived from the Arabic script such as Jawi. Since the 20th century, new scripts were mostly alphabets adapted from the Latin alphabet, as in the Hawaiian alphabet, Filipino alphabet, and Malay alphabet; however, several Formosan languages had been written in zhuyin, and Cia-Cia off Sulawesi has experimented with hangul. See also: the categories Religion in Oceania, Religion in the Philippines, Religion in Indonesia, Religion in Malaysia, Religion in Madagascar, Religion in East Timor, Religion in Brunei, and Religion in Singapore. Right: Balinese small familial house shrines to honor the households' ancestor in Bali island, Indonesia. The Slit drums is an indigenous Austronesian musical instrument that were invented and used by the Southeast Asian-Austronesian, and Oceanic-Austronesian ethnic groups. 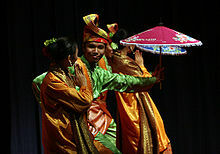 Gong ensembles are also a common musical heritage of Island Southeast Asia. 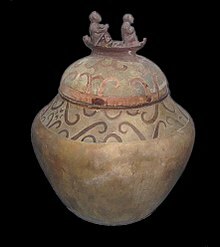 The casting of gong instruments are believed to have originated from the Bronze Age cultures of Mainland Southeast Asia. It spread to Austronesian islands initially through trade as prestige goods. However, Mainland Asian gongs were never used in ensembles. 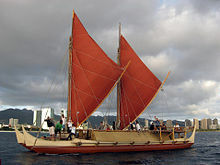 The innovation of using gong sets is uniquely Austronesian. Gong ensembles are found in western Malayo-Polynesian groups, though they never penetrated much further east. There are roughly two gong ensemble traditions among Austronesians, which also produced gongs in ancient times. In western Island Southeast Asia, these traditions are collectively known as Gamelan and is centered on the island of Java in Indonesia. It includes the Celempung of the Malay Peninsula, Talempung of northern Sumatra, Caklempung of central Sumatra, Chalempung of southern Sumatra, Bonang of Java, Kromong of western Kalimantan, Engkromong of Sarawak, and Trompong of western Nusa Tenggara. In eastern Island Southeast Asia, these traditions are known as Kulintang and is centered in Mindanao and the Sulu archipelago of the southern Philippines. It includes the Kulintangan of Sabah and Palawan, Kolintang of northern Sulawesi, Kulintang of Halmahera and Timor, and the Totobuang of the southern Maluku Islands. ^ "Population movement in the Pacific: A perspective on future prospects". Archived from the original on 7 February 2013. Retrieved 22 July 2013. 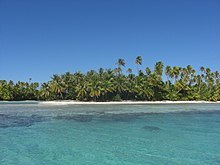 ^ "FIJI TODAY 2005 / 2006" (PDF). Archived from the original (PDF) on 3 April 2007. Retrieved 23 March 2007. ^ a b c d e Blust, Robert A. (2013). The Austronesian languages. Asia-Pacific Linguistics. Australian National University. ISBN 9781922185075. ^ a b Blust, Robert A. (1999). "Subgrouping, circularity and extinction: some issues in Austronesian comparative linguistics". In Zeitoun, Elizabeth; Li, Paul Jen-kuei (eds.). Selected Papers from the Eighth International Conference on Austronesian Linguistics. Institute of Linguistics (Preparatory Office), Academia Sinica. pp. 31–94. ^ a b Blench, Roger (2012). "Almost Everything You Believed about the Austronesians Isn't True". In Tjoa-Bonatz, Mai Lin; Reinecke, Andreas; Bonatz, Dominik (eds.). Crossing Borders (PDF). National University of Singapore Press. pp. 128–148. ISBN 9789971696429. ^ Horridge, Adrian (1986). "The Evolution of Pacific Canoe Rigs". The Journal of Pacific History. 21 (2): 83–89. JSTOR 25168892. ^ a b c d e f g h i j k l m n o p Chambers, Geoffrey K.; Edinur, Hisham A. (2015). "The Austronesian Diaspora: A Synthetic Total Evidence Model". Global Journal of Anthropology Research. 2 (2): 53–65. ^ Wibisono, Sonny Chr. (2006). "Stylochronology of Early Pottery in the Islands of Southeast Asia: A Reassessment of Archaeological Evidence of Austronesia". In Simanjuntak, Truman; Pojoh, Ingrid H.E. ; Hisyam, Mohammad (eds.). Austronesian Diaspora and the Ethnogeneses of People in Indonesian Archipelago: Proceedings of the International Symposium. Indonesian Institute of Sciences. p. 107. ISBN 9789792624366. ^ Bellwood, Peter (1991). "The Austronesian Dispersal and the Origin of Languages". Scientific American. 265 (1): 88–93. JSTOR 24936983. ^ a b c Blench, Roger (2016). "Splitting up Proto-Malayopolynesian: New Models of Dispersal from Taiwan". In Prasetyo, Bagyo; Nastiti, Tito Surti; Simanjuntak, Truman (eds.). Austronesian Diaspora: A New Perspective (PDF). Gadjah Mada University Press. ISBN 9786023862023. ^ a b c Burney, David A.; Burney, Lida Pigott; Godfrey, Laurie R.; Jungers, William L.; Goodman, Steven M.; Wright, Henry T.; Jull, A.J. Timothy (August 2004). "A chronology for late prehistoric Madagascar". Journal of Human Evolution. 47 (1–2): 25–63. doi:10.1016/j.jhevol.2004.05.005. ^ Gunn, Bee F.; Baudouin, Luc; Olsen, Kenneth M.; Ingvarsson, Pär K. (22 June 2011). "Independent Origins of Cultivated Coconut (Cocos nucifera L.) in the Old World Tropics". PLoS ONE. 6 (6): e21143. doi:10.1371/journal.pone.0021143. ^ a b c Dewar, Robert E.; Wright, Henry T. (1993). "The culture history of Madagascar". Journal of World Prehistory. 7 (4): 417–466. ^ a b Blench, Roger (2009). "Remapping the Austronesian expansion". In Evans, Bethwyn (ed.). Discovering History Through Language: Papers in Honour of Malcolm Ross (PDF). Pacific Linguistics. ISBN 9780858836051. ^ Bulbeck, David (December 2008). "An Integrated Perspective On The Austronesian Diaspora: The Switch from Cereal Agriculture to Maritime Foraging in the Colonisation of Island Southeast Asia" (PDF). Australian Archaeology. 67 (1): 31–51. doi:10.1080/03122417.2008.11681877. ^ Goss, Jon; Lindquist, Bruce (2000). "Placing Movers: An Overview of the Asian-Pacific Migration System" (PDF). The Contemporary Pacific. 12 (2): 385–414. ^ a b c d e Lipson, Mark; Loh, Po-Ru; Patterson, Nick; Moorjani, Priya; Ko, Ying-Chin; Stoneking, Mark; Berger, Bonnie; Reich, David (2014). "Reconstructing Austronesian population history in Island Southeast Asia" (PDF). Nature Communications. 5 (1): 1–21. doi:10.1038/ncomms5689. ^ Matsumura, Hirofumi; Shinoda, Ken-ichi; Shimanjuntak, Truman; Oktaviana, Adhi Agus; Noerwidi, Sofwan; Octavianus Sofian, Harry; Prastiningtyas, Dyah; Nguyen, Lan Cuong; Kakuda, Tsuneo; Kanzawa-Kiriyama, Hideaki; Adachi, Noboru; Hung, Hsiao-chun; Fan, Xuechun; Wu, Xiujie; Willis, Anna; Oxenham, Marc F.; Yao, Yong-Gang (22 June 2018). "Cranio-morphometric and aDNA corroboration of the Austronesian dispersal model in ancient Island Southeast Asia: Support from Gua Harimau, Indonesia". PLOS ONE. 13 (6): e0198689. doi:10.1371/journal.pone.0198689. ^ a b c d e f Jinam, Timothy A.; Phipps, Maude E.; Aghakhanian, Farhang; Majumder, Partha P.; Datar, Francisco; Stoneking, Mark; Sawai, Hiromi; Nishida, Nao; Tokunaga, Katsushi; Kawamura, Shoji; Omoto, Keiichi; Saitou, Naruya (August 2017). "Discerning the Origins of the Negritos, First Sundaland People: Deep Divergence and Archaic Admixture". Genome Biology and Evolution. 9 (8): 2013–2022. doi:10.1093/gbe/evx118. ^ a b c Mahdi, Waruno (2017). "Pre-Austronesian Origins of Seafaring in Insular Southeast Asia". In Acri, Andrea; Blench, Roger; Landmann, Alexandra (eds.). Spirits and Ships: Cultural Transfers in Early Monsoon Asia. ISEAS - Yusof Ishak Institute. pp. 325–440. ISBN 9789814762755. ^ Matsumara, Hirofumi; Hung, Hsiao-chun; Cuong, Nguyen Lan; Zhao, Ya-feng; He, Gang; Chi, Zhang (2017). "Mid-Holocene Hunter-Gatherers 'Gaomiao' in Hunan, China: The First of the Two-layer Model in the Population History of East/Southeast Asia". In Piper, Philip J.; Matsumura, Hirofumi; Bulbeck, David (eds.). New Perspectives in Southeast Asian and Pacific Prehistory. ANU Press. pp. 61–78. doi:10.22459/TA45.03.2017.04. ISBN 9781760460945. ^ Détroit, Florent; Corny, Julien; Dizon, Eusebio Z.; Mijares, Armand S. (2013). ""Small Size" in the Philippine Human Fossil Record: Is It Meaningful for a Better Understanding of the Evolutionary History of the Negritos?" (PDF). Human Biology. 85 (1): 45–66. ^ Détroit, F.; Mijares, A.S.; Corny, J.; Daver, G.; Zanolli, C.; Dizon, E; Robles, E.; Grün, R.; Piper, P.J. (2019). "A new species of Homo from the Late Pleistocene of the Philippines". Nature. 568 (7751): 181–186. doi:10.1038/s41586-019-1067-9. ^ Reich, David; Patterson, Nick; Kircher, Martin; Delfin, Frederick; Nandineni, Madhusudan R.; Pugach, Irina; Ko, Albert Min-Shan; Ko, Ying-Chin; Jinam, Timothy A.; Phipps, Maude E.; Saitou, Naruya; Wollstein, Andreas; Kayser, Manfred; Pääbo, Svante; Stoneking, Mark (October 2011). "Denisova Admixture and the First Modern Human Dispersals into Southeast Asia and Oceania". The American Journal of Human Genetics. 89 (4): 516–528. doi:10.1016/j.ajhg.2011.09.005. PMC 3188841. ^ Cooper, A.; Stringer, C. B. (17 October 2013). "Did the Denisovans Cross Wallace's Line?". Science. 342 (6156): 321–323. doi:10.1126/science.1244869. ^ a b Melton, Terry; Clifford, Stephanie; Martinson, Jeremy; Batzer, Mark; Stoneking, Mark (December 1998). "Genetic Evidence for the Proto-Austronesian Homeland in Asia: mtDNA and Nuclear DNA Variation in Taiwanese Aboriginal Tribes" (PDF). The American Journal of Human Genetics. 63 (6): 1807–1823. doi:10.1086/302131. ^ Mirabal, Sheyla; Cadenas, Alicia M.; Garcia-Bertrand, Ralph; Herrera, Rene J. (April 2013). "Ascertaining the role of Taiwan as a source for the Austronesian expansion" (PDF). American Journal of Physical Anthropology. 150 (4): 551–564. doi:10.1002/ajpa.22226. ^ a b Blench, Roger (2008). "Stratification in the peopling of China: How far does the linguistic evidence match genetics and archaeology?". In Sanchez-Mazas, Alicia; Blench, Roger; Ross, Malcolm D.; Peiros, Ilia; Lin, Marie (eds.). 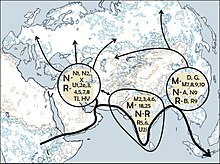 Past Human Migrations in East Asia: Matching Archaeology, Linguistics and Genetics (PDF). Routledge Studies in the Early History of Asia. Routledge. pp. 105–132. ISBN 9781134149629. ^ a b Simanjuntak, Truman (2017). "The Western Route Migration: A Second Probable Neolithic Diffusion to Indonesia". In Piper, Hirofumi Matsumura and David Bulbeck, Philip J.; Matsumura, Hirofumi; Bulbeck, David (eds.). New Perspectives in Southeast Asian and Pacific Prehistory. terra australis. 45. ANU Press. ISBN 9781760460952. ^ a b Ross, Malcolm D. (2008). "The integrity of the Austronesian language family: From Taiwan to Oceania". In Sanchez-Mazas, Alicia; Blench, Roger; Ross, Malcolm D.; Peiros, Ilia; Lin, Marie (eds.). 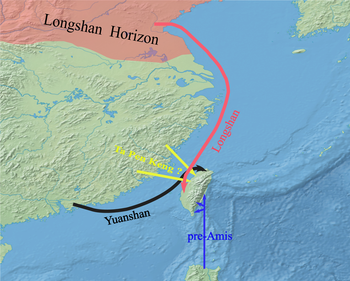 Past Human Migrations in East Asia: Matching Archaeology, Linguistics and Genetics. Routledge Studies in the Early History of Asia. Routledge. pp. 161–181. ISBN 9781134149629. ^ van Driem, George (1998). "Neolithic correlates of ancient Tibeto-Burman migrations". In Blench, Roger; Spriggs, Matthew (eds.). Archaeology and Language II: Archaeological Data and Linguistic Hypotheses. One World Archaeology. 29. Routledge. pp. 67–102. ISBN 9780415117616. ^ a b c d e Blench, Roger (2017). 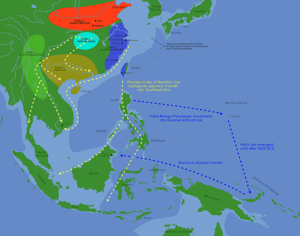 "Ethnographic and archaeological correlates for a mainland Southeast Asia linguistic area". In Acri, Andrea; Blench, Roger; Landmann, Alexandra (eds.). Spirits and Ships: Cultural Transfers in Early Monsoon Asia (PDF). ISEAS - Yusof Ishak Institute. pp. 207–238. ISBN 9789814762755. ^ Kun, Ho Chuan (2006). "On the Origins of Taiwan Austronesians". In K. R. Howe (ed.). Vaka Moana: Voyages of the Ancestors (3rd ed.). Honolulu: University of Hawai'i Press. pp. 92–93. ISBN 978-0-8248-3213-1. ^ Pawley, A. (2002). "The Austronesian dispersal: languages, technologies and people". In Bellwood, Peter S.; Renfrew, Colin (eds.). Examining the farming/language dispersal hypothesis. McDonald Institute for Archaeological Research, University of Cambridge. pp. 251–273. ISBN 978-1902937205. ^ a b Oppenheimer, Stephen (1998). Eden in the east: the drowned continent. London: Weidenfeld & Nicolson. ISBN 0-297-81816-3. ^ Lipson, Mark; Loh, Po-Ru; Patterson, Nick; Moorjani, Priya; Ko, Ying-Chin; Stoneking, Mark; Berger, Bonnie; Reich, David (19 August 2014). "Reconstructing Austronesian population history in Island Southeast Asia". Nature Communications. 5 (1): 4689. doi:10.1038/ncomms5689. PMC 4143916. PMID 25137359. ^ Krutak, Lars (2005–2006). "Return of the Headhunters: The Philippine Tattoo Revival". The Vanishing Tattoo. Retrieved 9 December 2013. ^ Kirch, Patrick V. (1998). "Lapita and Its Aftermath: the Austronesian Settlement of Oceania". In Goodenough, Ward H. (ed.). Prehistoric Settlement of the Pacific, Volume 86, Part 5. American Philosophical Society. p. 70. ISBN 978-0-87169-865-0. ^ Major-General Robley (1896). "Moko and Mokamokai — Chapter I — How Moko First Became Knows to Europeans". Moko; or Maori Tattooing. Chapman and Hall Limited. p. 5. Retrieved 26 September 2009. ^ Krutak, Lars (2009). "The Kalinga Batok (Tattoo) Festival". The Vanishing Tattoo. Retrieved 9 December 2013.